Is your travel league baseball team in desperate need of engaging baseball fundraising ideas? Do you want to hit a home run for your team’s fundraising goals this season? Are you looking for team building baseball fundraisers to meet your team’s goals while building comradery off the field? Look no further as partnering with the Inside Baseball Coaches Clinic, grants you elite access to the best baseball fundraiser ideas. We offer travel league baseball teams in Iowa collaborative opportunities by using our high-demand Vimeo videos. As part of our fundraising program, we offer travel league baseball teams in Iowa the opportunity to buy Inside Baseball Coaches Clinic’s videos to raise money for their team. Don’t miss out on this exceptional fundraising opportunity! 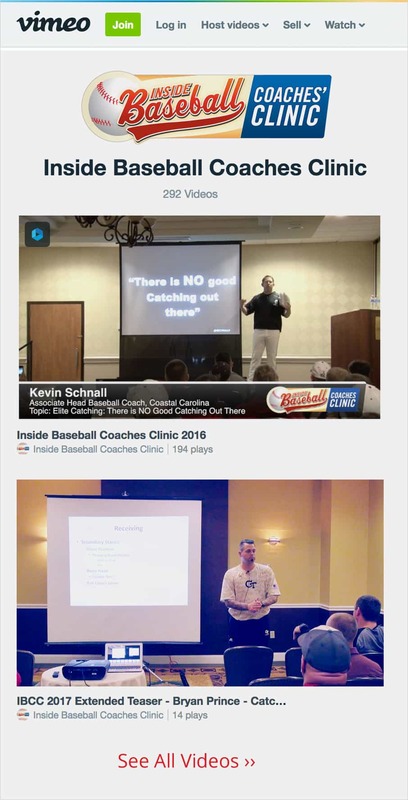 By visiting Inside Baseball Coaches Clinic’s Vimeo page, you can take full advantage of our travel league baseball fundraising special! Buy our videos and we will donate to your team as a way to promote baseball education and communities! For a limited time, you can buy the entire video playlist from our 2017 clinic for $429 and receive a discount that will reduce the price to only $329. In addition, Inside Baseball Coaches Clinic will donate 25% of the sale to your travel league baseball team via PayPal. Not only will you raise money for your travel league baseball team, you’ll also receive expert insight from the best of the best. Talk about a great deal! What is the Inside Baseball Coaches Clinic? On January 11th of 2018, you have the chance to become a better player, a better coach, a better manager, or even a better groundskeeper. Our 3rd annual Inside Baseball Coaches Clinic is a three-day event that showcases a top-rated college baseball coaches delivering over 60 interactive presentations in total. You won’t gain better baseball insight anywhere else! As Babe Ruth once said, “Never let the fear of striking out get in your way.” Baseball gives students an incredible way to learn discipline, teamwork, community, and the importance of hard work. These values have emerged in coaches’ teams who have attended our clinic. Are you interested in learning more about our baseball fundraisers and how to get your travel league baseball team involved? Are you looking for additional fundraising opportunities for your high school team, little league team, or youth team? Avoid striking out this season by contacting the Inside Baseball Coaches Clinic today! We’ve got 300+ years of baseball insight, all in one location! Stay Connected By Following Us!